Many around the world support the UN’s goals. Pope Francis endorsed them at the UN in 2015, right before representatives of most nations on the earth voted to accept them. Does humanity have the solutions? The world faces many problems. Many people are hungry. Many people are oppressed. Many people face poverty. Many nations are in serious debt. Children, including unborn ones, face abuse. Drug-resistant diseases concern many doctors. Major industrial cities have air too polluted to be healthy. Various politicians threaten war. Terrorist attacks keep happening. Can world leaders fix the problems facing humanity? This agenda is supposed to be fully implemented by 2030 and is also called the 2030 Agenda for Sustainable Development. It aims to solve ailments facing humanity through regulation, education, and international and interfaith cooperation. While many of its objectives are good, some of its methods and goals are evil (cf. Genesis 3:5). This agenda, also, is consistent with Pope Francis’s Laudato Si encyclical. Nearly all the nations in the world agreed to the Paris accords, which had specific environmental goals and financial commitments. (Then US President Barack Obama signed a document to commit the USA to this in 2016, but in 2017, US President Donald Trump stated that the United States would NOT accept the agreed to Paris accords. This caused international outrage and has helped isolate the US from Europe and many other parts of the world.) Pope Francis later stated humanity “will go down” if it does not make his changes related to the climate. While no one wants to breath polluted air, go hungry, be impoverished, be endangered, etc., will human attempts to meet the goals of the United Nations’ 2030 agenda and/or the Paris accords solve the problems facing humanity? The United Nations was formed and established on 24 October 1945, after World War II, in order to prevent another such conflict and to try to promote peace in the world. At its founding, the UN had 51 member states; there are now 193. There have been hundreds, if not thousands, of conflicts around the world since the United Nations formed, but we have not yet had what could be described as the third World War. Some believe that international cooperation like the United Nations claims to promote, combined with the type of interfaith and ecumenical agenda that Pope Francis and many other religious leaders are trying to promote, will bring peace and prosperity. However, the track record for the United Nations to do this has not been good. In addition to the numerous armed conflicts since the United Nations formed, multiple millions are hungry, refugees, and/or desperately poor. Over a decade ago, the United Nations set forth to implement its Millennium Development Goals. It had eight “development goals,” but this did not succeed, even according to the UN itself. So, in 2015, its so-called “17 Sustainable Development Goals” were adopted. Some are optimistic. Some consider it a utopian fantasy. As far as utopia goes, on May 6, 2016, Pope Francis said he dreamed of a humane European utopia that his church could help that continent attain. Yet, the Pope’s dream will turn out to be a nightmare (cf. Revelation 18). Yet, many humans are working towards their view of a utopian society and even sometimes try to involve religion. But almost none are willing to follow the ways of the one true God. It is not that there will be no progress towards any of the United Nation’s or the Vatican’s goals. There will be some, as well as some setbacks. Actually, and probably after massive conflict, a type of international peace deal will be agreed to and confirmed (Daniel 9:27). When it is, many will falsely tend to believe that humanity will be bringing about a more peaceful and utopian society. Many will be taken in by such international ‘utopian progress’ (cf. Ezekiel 13:10) as well as by various signs and wonders (2 Thessalonians 2:9-12). But the Bible says such peace will not last (Daniel 9:27; 11:31-44), despite what leaders may claim (1 Thessalonians 5:3; Isaiah 59:8). The idea that, apart from Jesus, humanity can bring utopia in this ‘present evil age’ is a false gospel (Galatians 1:3-10). 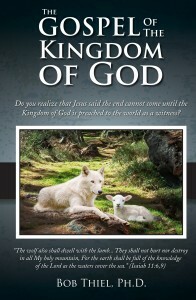 Here is a link to our free online booklet The Gospel of the Kingdom of God. 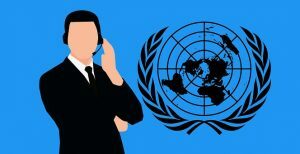 While the world seems to be impressed by the UN’s agenda, what the Vatican and the UN are seemingly trying to do is repeatedly warned against in the Bible (Revelation 13:1-18, 14:12, 18:4; Zechariah 2:6-7). The fact that US President Donald Trump is working to pull the USA out of this agreement will not be well remembered by world leaders or the Vatican. What about some type of world government by 2030? There may very well be a world government by then as the 6,000 years God has allowed humanity to rule itself under Satan’s influence is drawing to a close. First, the world will see a world government dominated by the Beast and Antichrist, and then after they are defeated (Revelation 19), the one glorious government known as the millennial Kingdom of God (Revelation 20:1-6). Armageddon Who is involved and when will this gathering happen? Here is also a video from Dr. Thiel, from Tel Megiddo in Israel: Armageddon. Another video is related to China’s One Belt, One Road Initiative (Silk Road project): watch Is China paving roads to Armageddon? Beware: Protestants Going Towards Ecumenical Destruction! What is going on in the Protestant world? Are Protestants turning back to their ‘mother church’ in Rome? Does the Bible warn about this? What are Catholic plans and prophecies related to this? Is Protestantism doomed? As far as some changes affecting Protestantism and Pope Francis, watch the video Charismatic Kenneth Copeland and Anglican Tony Palmer: Protestants Beware! This entry was posted on Sunday, October 28th, 2018 at 2:00 pm	and is filed under Prophecy.